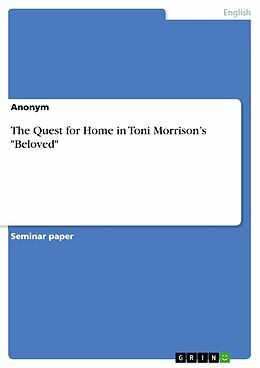 The Quest for Home in Toni Morrison's "Beloved"
Seminar paper from the year 2010 in the subject American Studies - Literature, grade: 1,7, University of Constance, language: English, abstract: This paper will attempt to analyze the concepts of home in Toni Morrison&apos;s novel "Beloved". Sites of home in "Beloved" are seldomly what we expect them to be, because the author wants us to question our understanding of home and the processes that constitute it. So far remarkably few critics focused on home in Morrison&apos;s novel that is based on the historical person Margaret Garner. Among those who did are, most notably, Danielle Russell and Justine Tally. In order to consider this, an examination of the concept of home in Gothic as well as postcolonial literature seems helpful. Note on the restrictions of this essay may seem necessary, as only a short and unfortunately survey of the concepts of home in Gothic and postcolonial fiction can be given. Nonetheless, effort was given to mention the major developments of home and give possible motivations for employing it. The paper will then continue with a closer examination of the sites of home in "Beloved" mentioned before. Titre: The Quest for Home in Toni Morrison's "Beloved"